As a graduate student in Syracuse, NY and a food lover, I found Syracuse to be a difficult place to live in at times. The weather was horrible which I probably should have known but living in it was worse than I thought. On my search for the arts and local culture, I found that Syracuse does have pockets but it takes some serious searching. Funk and Waffles is a "funky" and fun place near Syracuse University to listen to some acoustic music and have killer waffles. I adored the food at Beer Belly Deli pub in Westcott. Speaking of Westcott, I would absolutely check out this hippie little street for yoga, coffeeshops, and some good local eats. Syracuse is the land of diners. The diner scene is on point! Can anyone say: hash browns and pancakes?! Diners are great for budget travelers in this city. My favorite was Stella's diner (although get there early on the weekend!) which boasts the best chocolate chip pancakes. Downtown Syracuse also contains some gems such as Pastabilities with TO DIE FOR Spicy Hot Tomato Oil. Syracuse is a great time if you are a student who loves searching for some good local eats. I grew up in Syracuse and think it's a fantastic place to raise a family and go to school (Go Syracuse University!). Syracuse gets a full dose of all the seasons. It has boat loads of snow in the winter, terrific apple picking in autumn, incredible spring thunderstorms and warm summer months that you can spend beside the Finger Lakes. Old building structured in the mid-1800's that used to be the library for congress. It's now a Bank of America. Syracuse is a nice city in central New York. There are some nice homey restaurants and a very good art museum. A large mall on the outskirts is becoming a destination by itself. Should say I liked it as I lived there 6 years but I've never looked back since leaving. it's no NYC, but for upstate NY, you can find almost anything you're looking for. For everything else, a car is need to get around to surrounding towns to find the gems of the area. I went to school in this area. If you don't like cold weather this is not the place for you. It snows from October - April. This is basically a college town. The cost of living here is low so you can get a house for a great price. Armory Square is a nice area for nightlife. Can't go wrong with going to a Syracuse Basketball game or a LeMoyne Lax game. Being probably the most underrated city in the tri-state area, Syracuse has a little something for everybody. 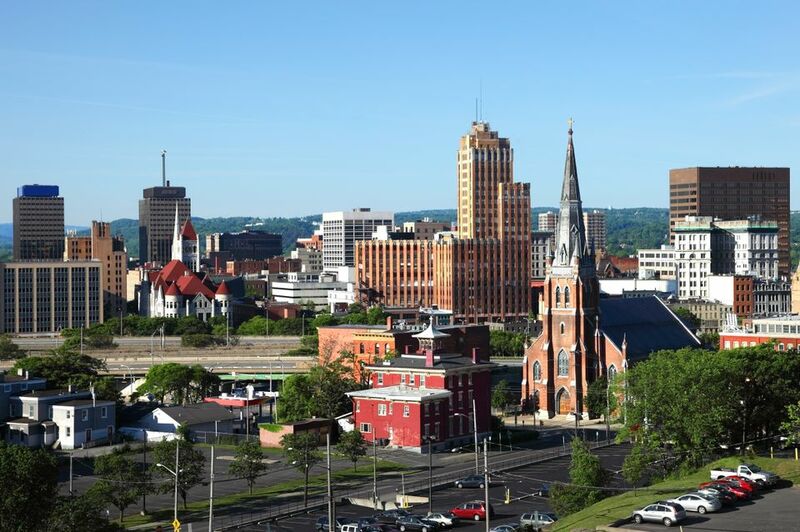 Attractions such as the The Turning Stone casino, the iconic Dinosaur BBQ, and the Middle Ages brewery help deflect some attention away from the rambunctious college campus. However, the home of the Orangemen will always be this city's biggest pull. As entertaining as this city is, I wouldn't go as far to say that its a vacation spot, citing the region's frigid winter and lack of relaxing attractions. However, if you're looking for a delicious meal, Cuse, as the areas natives refer to it, has multiple options of various ethnicities and portion sizes. The downtown area is a hotbed for niche restaurants like Empire Brewery and Blue Tusk where a hungry patron could go home happy after a "why didn't I think of that?" type meal such as a smoked gouda cheeseburger or one of Syracuse's famous Friday fish frys. To end your night, you need to determine if you'll attempt to brave the college campus, laden with open house parties all up and down Euclid street, exclusive fraternity parties around frat row, and the versatile and always popular Chuck's Cafe. If you're looking for a bit of an older crowd, the downtown area may be your answer. Al's wine and whisky, Empire Brewery, and the southern styles Daisy Duke's can all be the answer to your nightlife curiosities. Home Of the New York State Fair.